Q: I'm having a hard time getting in the front door. 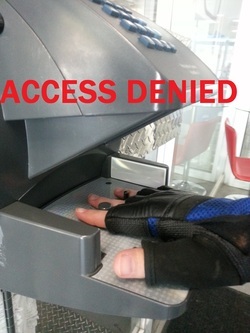 I know my member ID is correct, but the hand scanner won't let me in! A: Mano Incognito: Are you wearing a large ring or long sleeves that hang over part of your hand? The hand scanner recognizes the size and shape of your hand, so if you're wearing something that changes that size or shape, the scanner won't recognize your hand and won't let you in.